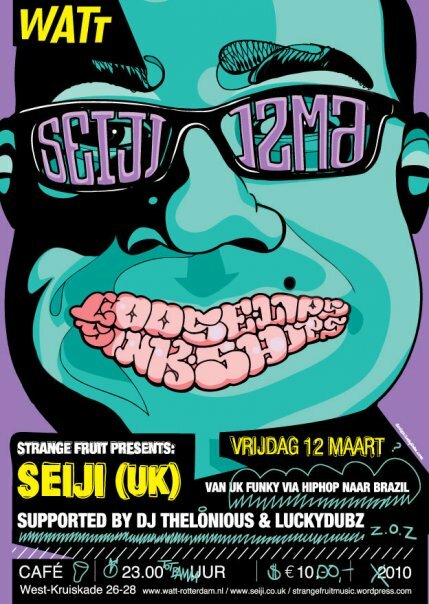 Strange Fruit knows that they are on to something otherwise they wouldn’t have bothered to invite SEIJI over. But for those of you who are still in need of a little push in the right direction…I suggest you read this very recent article Fact Magazine did on Seiji and the download that comes with the article is a definite must have!! If you really want it…. download fast because it will only be available for 3 weeks after the 5th of March. Time for yet another SEIJI warming up!! Below I have collected as many of the seijgoodies as I can….so you can listen and get an impression of what SEIJI is capable of and when your done shaking your bum you can download them for free after you click here. If this feels like a music overdose…You’re right…cause it’s supposed to be. Since I am convinced that you’ll want to be there…. the time has come for details (in Dutch) and tickets when you click here. Afcourse nothing has to happen in the exact order we suggested above..but we most definitely order you to…ENJOY!! Ja ja, ik ben aanwezig!